Cellular DNA is under constant assault – from normal metabolism and from environmental factors like chemicals, UV light and radiation. To maintain genomic integrity and resist tumor-causing mutations, cells sense DNA damage and activate DNA repair processes or programmed cell death. Loss of the DNA damage sensor Atm in mice results in T-cell leukemia. Atm phosphorylates Bid, a protein that promotes cell death. To explore Bid’s role in vivo and probe its Atm-independent functions, Sandra Zinkel, M.D., Ph.D., assistant professor of Medicine, and colleagues generated mice missing both Bid and Atm. 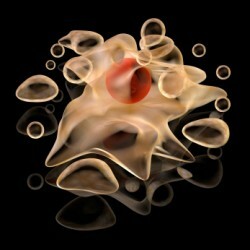 They were surprised to find that T-cell leukemia developed more slowly in these mice, compared to mice missing only Atm. Mice missing Atm and Bid have impaired cell cycle checkpoint control and increased cell death of developing T cells, which prevents the propagation of deleterious mutations. The findings, reported in the July issue of Cell Death and Differentiation, support the important roles of Bid and related Bcl-2 family members in regulating cell death and suggest their actions depend on cell-type and context. This research was supported by grants from the Sidney Kimmel Foundation, the G and P Foundation, the American Cancer Society, the National Institutes of Health (CA098394, HL088347) and the Lady Tata Memorial Trust.